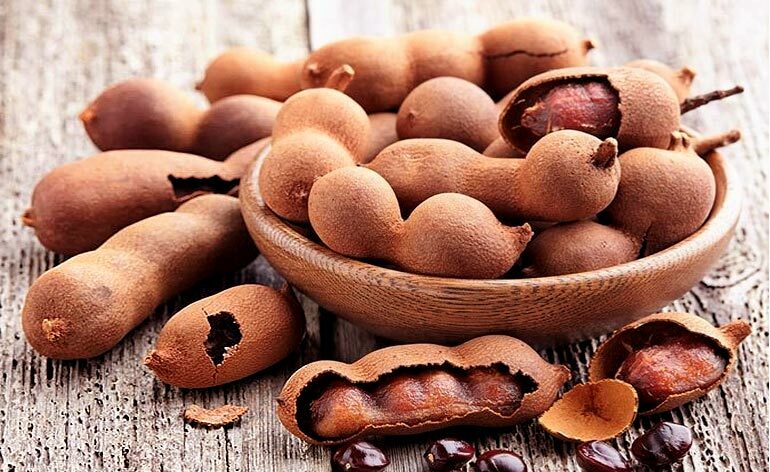 Home » Diet » Top 5 Health Benefits of Tamarind! Tamarind is a sticky, fleshy, pulpy fruit with a sweet and tangy taste that grows within brown pods. It’s been a widely used spice-condiment staple in the South-Asian kitchen for thousands of years. However, the fruit is not only used for culinary purposes, but also for medical ones thanks to its high, nutrient-dense content. Now let’s find out why it’s built quite a reputation over the years with these Top 5 Health Benefits of Tamarind! Tamarind helps your stomach to digest food faster as it stimulates the activity of bile (the fluid produced by your liver to digest fats). It has been also used as a traditional laxative due to its high amount of dietary fibre (tannins, mucilage, and pectin). Studies have shown that it’s also effective in cases of chronic diarrhoea as well. So, let’s just say, it works its magic when it comes to digestion! Tamarind contains high amounts of vitamins: C, E, B and minerals (calcium, iron potassium and manganese), which will help support and boost your immune system. In addition, it has a high level of tartaric acid (hence the ‘tart’ taste) which is a powerful antioxidant. Antioxidants are also one of the major elements in fighting and reducing the effects of cancer. Tamarind has also long been used throughout history to treat fever and sore throats. Not only does the fruit come with health benefits, the seeds, leaves and the bark do too. They’ve been used for instance to heal injuries and wounds, as well as on swollen joints. The consumption of tamarind seed powder with water daily can help enhance the lubrication of your knee joints, making it particularly beneficial for elderly people. The fruit is also anti-inflammatory and is commonly used to reduce eye irritation. Tamarind can be really great for your skin too and has proven to be a great, natural skin protector over the years. The seeds contain alpha hydroxy acid (AHA) which helps your body in clearing clogged pores and removing dead skin cells. It also acts as an anti-aging formula supporting your skin’s elasticity, providing hydration which results in smoothness. Tamarind seed is water-soluble and is therefore used widely in serums, gels, facial toners, moisturizers and masks. Tamarind contains an enzyme called alpha-amylase, which reduces your blood sugar level. Studies have shown that tamarind can also lower ‘bad cholesterol’ levels (LDL) whilst simultaneously increasing the good type (HDL), thanks to the flavonoids and antioxidants found in the fruit. The list goes on…no wonder the cultivation of tamarind has spread to several warm, tropical climates around the world. You can buy this fruit fresh, dried as a paste or powder in your local health food stores or online. Have you tried it, what did it do for you; love it, hate it? Let us know by commenting below or @ KeepfitKingdom ! 5 Foods You Never Knew Were Vegan!